In a world where there's a constant push towards the next major advance in resolution and clarity, it's easy to forget the artistic potential of low fidelity. Leviathan - documenting life on board North American fishing vessels and the wild waters surrounding them - is a film that is not exactly what we've come to expect from the digital revolution: it offers grainy, muddy cinematography and digitally distorted soundtrack that seems more suited to a laptop's small screen and crappy in-built speakers than a big screen. And yet Leviathan one of the most vital cinematic experiences of the year. Let's address the visuals first. Shot primarily on GoPro and DSLRs, the film cannot possibly hope to counter the rich colours and resolution of RED, Alexa or good old 35mm. The cameras do, however, afford the filmmakers an agility and adaptability beyond the possibilities of traditional cameras. The extended opening sequence is a wonderful example. Taking the form of an almost quarter-hour-long POV of a fisherman, it's confusing, muddled and disorientating. Which is exactly what it needs to be to portray the chaos of being on board a trawler. The head-worn camera might be struggling, but it's a brilliantly immersive way of building the viewer's sea-legs, while simultaneously establishing the film's identity as something of a visual poem. This isn't a 'documentary' just about honest-to-goodness documentation, although it does provide the viewer with an all-access pass into life on board a dangerous (the closing credits dedicate the film to named sunken trawlers), repetitive and claustrophobic fishing boat through constantly imaginative camera placement (everything from freeform movement to static placement is utilised smartly by Castaing-Taylor and Paravel). Instead, both the limitations and manouverability of the consumer cameras are also utilised to create something more abstract. Unusual angles are used to capture the sometimes violent, sometimes poignant relationship between man and his environment - such as memorable shots of blood and 'waste' fish being dumped overboard and returned to the deep. It could easily be read as an enivornmentally conscious film, although the filmmakers wisely keep any subtexts well-and-truly 'sub' and open to interpretation. The dizzying cinematography is sometimes also used to deeply unsettle the viewer - such as an extraordinary final sequence that implicates both a towering trawler and the wild, unpredictable sea as the 'leviathan' of the title. I don't believe it's too much of a stretch to describe certain moments of Leviathan as resembling a horror or monster movie more than anything else, and not just the visceral and explicit scenes of gutting and cutting. What the filmmakers really use as a way to unnerve viewers, and perhaps force some to reach for a stiff drink once the credits role, is the sound design. 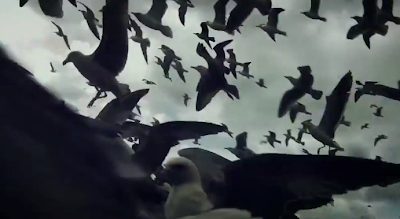 Foregoing the temptation of a traditional experimental score - any music is diegetic - the soundtrack is instead a stunning mixture of mashing machinery, waging winds, whacking waves and squawking seagulls. The audio is tinny, digital and distorted; a heady combination of raw environmental sound capture and complex mixing. It's a beautiful aural nightmare, where even the (extremely limited) dialogue is muffled and often incomprehensible. It barely offers the viewer a rest but illuminates how much of a pleasure - although pleasure may not be the correct word in the context of the exhausting Leviathan - it is to see a film with such imagination put into the sound design. This is a film designed to shellshock, and the filmmakers aim for your ears as well as your eyes. At times during its running time, Leviathan brought to mind an experimental episode of Deadliest Catch, perhaps directed by David Lynch or Gasper Noe. These early thoughts were rewarded with a uninterrupted five minute plus static shot of an exhausted fisherman drifting off while watching an episode of said Discovery Channel show. It's a rare and welcome moment of calm amidst an overwhelming sense of terror and restlessness. Leviathan is a dark film at times - not least because of the cameras' poor low light capabilities - but it can also be surprisingly poignant and respectful to its subjects (man and nature alike). It's a tribute to the work of fishermen, but also wonders what impact their - and by extension our - actions might be having on our world and its oceanic creatures. Despite featuring only a handful of brief, muffled conversations, Leviathan is a film of provocative questions and ponderings, viscerally articulated through cheap cameras and barely capable microphones. Who the hell needs 4K?